Scene shift incoming! Two of your favorite people are back! See who when you vote for Snow by Night on Top Web Comics. Wow, both of you just wow. First of Vivanne you make some good points your reputation proceeds you. Marg you DON’T know the terrain lay out or anything of the land taking her with you as a guide would actually be intelligent, but well both of you are probably in for a rude awakening. I don’t know, I actually agree with Marguerite here. 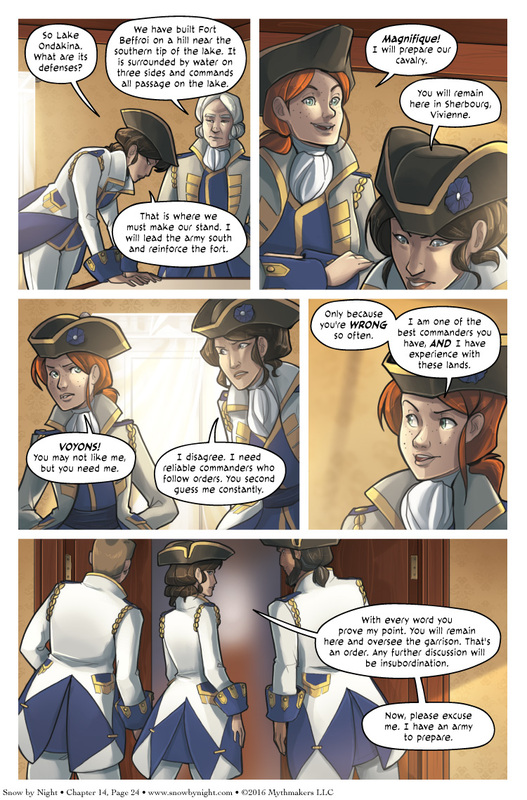 She can easily take one of the other local commanders (Vivienne’s only ONE of the best, as she said) and still have someone who’ll know the area and the peoples in the area. And one who’s not likely to countermand and argue with her just because they’re rivals in some silly social game that should be kept entirely outside of the sphere of any pending or ongoing military action. I think you’re right, there is a time for disagreement and a time for following the chain of command. Even if Marguerite ends up being wrong in her assessment, which is quite possible, it would be in the best interests of the troops if Vivienne does as she is commanded and show solidarity among the leadership, otherwise morale will suffer. Personally, I would probably mobilize the army to support the fort’s flanks and try not to overcommit my professional army without knowing the full array and disposition of forces against me, but if this is following the equivalent time period of European warfare tactics (18th or early 19th century), mobility is not really a consideration (or option, sometimes) by the command staff. It will be very interesting to see how this plays out! Well, I’m sure Vivienne will follow her orders to the letter and not cause any trouble in the future. I hope she will, because I predict that Marguerite would lose the fort and be forced to flee back here. And this is why mixing military service, politics, and personal grudges is baaaaaaaaaaaad news. Marguerite is mostly right here, at least if we assume Vivienne is not virtually the only experienced commander who knows the terrain. Having a commanding officer who constantly second guesses your orders AND probably waits for an opportunity to play the hero in order to humiliate and outshine you can be a serious disadvantage in a battle, at the very least it is a lose cannon that would have an unpredictable effect and could severely disrupt your tactics. On the other hand, Margeurite leaving Vivienne behind is most probably not a purely selfless tactical decision either, she wants to humiliate Vivienne by giving her a position were she would probably not get any chance to earn merits. Fort Ticonderoga used to be called Fort Carillon. A carillon is a set of bells, usually located in a belfry. The French word for belfry is beffroi. This fort here is called Fort Beffroi. Any coincidence would be perfectly deliberate. Yeah, with those two running things, I’d be joining the other side. FAST. Wait, this is an option? Let’s defect, quickly!